IE6: To Test or Not To Test? This is the question that plagues most web developers. IE6 has been around for 10 years now and I'm sure developers have been hating it for the past 5 years. Not everyone has moved on from IE6 even though Internet Explorer is pushing out IE9 (currently in Beta, but to be released sometime this year). IE6 doesn't support a lot of things and not to mention the amount of bugs that pop up while using it. It also is lacking security features, like privacy. It's so old it lacks many of the new features that appear in current web browsers today. I found a website, BrowserUpgrade.info, which discusses some of the things I mentioned above. It also states that IE6 is bad for users because there are security risks and bad for businesses because developers are wasting their time trying to get their websites to work correctly. The answer for some developers are hacks, but this slows down the site and makes it difficult to update the site. IE6 lacks many well-loved features such as tabs, RSS integration, transparent PNGs, etc. This article, Top 30 Websites, Viewed in IE6, by Elated that was written in November last year. So just last year these websites were developed, which for the most part work in IE6, and wasted time making sure that the still looked the same and worked the same in IE6. 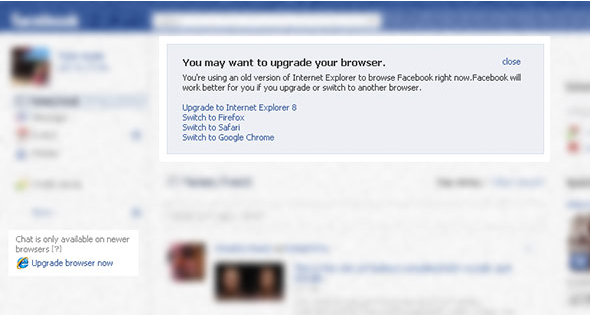 Even Facebook produces a pop up that says it would be better to upgrade to a newer version or use a different web browser. It says not everything will work on their website, including the chat feature. So it has come time for developers to take a stand, which they have been doing for a few years now, and they have been heard. 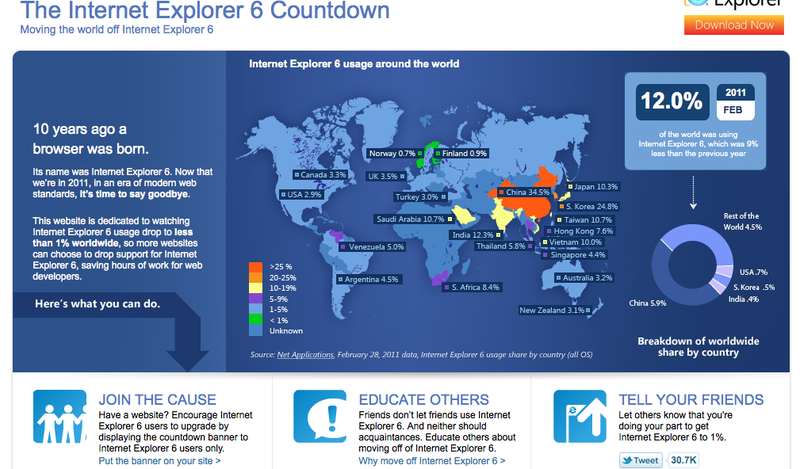 I stumbled across this website powered by Microsoft called IE6 Countdown. Microsoft has dedicated this website to watch IE6 drop from the current 12% (which has dropped 9% from the previous year) of the world using it to 1%. According to W3schools, that number is already even lower: 26% of users use IE; of that only 4% are still on IE6 = less than 2% [Jan 2011]. They have also noticed that it would save developers time once IE6 is gone and have also posted how to join the cause and spread the news on this site. So now that Microsoft has come to the realization with the rest of it, what can we do as designers until this count reaches 1%? This is where designing and presenting in the browser comes into play. This is something that Andy Clarke discusses in this article Ignorance Is Bliss. Instead of designing a layout in Photoshop, providing a static image that brings expectations; design in the browser. This will allow the developer to correct these errors that appear in different browsers. Don't do this with IE hacks to try and make PNGs work or creating rounded corners, just design a different layout that is similar but looks/works well in the browser that your client will view it in. The client is going to go through every browser to make sure that it looks the same. In the article, two clients from the company were satisfied with the website when they viewed it in their browsers. They saw two different layouts for the same site and they both approved the design/development because they were happy with it. 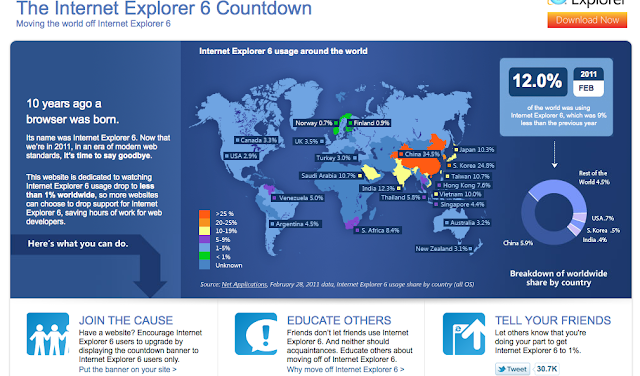 In summary, don't succumb to IE6's evil ways. Don't develop so that your site looks the same in every browser, despite their flaws. Embrace their flaws, at least you know what they are and you can just design differently to accommodate for that. If your client is using IE6, send them that website that Microsoft posted. If they insist on not upgrading their browser, then make them a simple site; and if they say it's too simple, tell them that IE6 doesn't allow for you to use rounded corners or PNGs or whatever it is they're wanting that IE6 doesn't allow. TBH Creative addresses the browser testing issue and IE 6 on our accessibility web page. We recommend that you upgrade: your online experience is sure to increase with better looking websites, nice features, and more. Unleash a more beautiful web! It's time to upgrade to the world's most widely-used browser. For a business website to succeed, you need to have an expert on your team constantly evaluating visitor trends, design, usability and accessibility... and issues like browsers. TBH Creative would like to help and specializes in web design for businesses. We serve Indianapolis, Fishers, Carmel, Zionsville, Avon, Greenwood, Beech Grove and other surrounding areas or other states virtually. We welcome the opportunity to discuss an online strategy for your business. Check out some of our recent web design work in our portfolio.